210, Trem, Maylay Sparks feat. K Sluggah & Chukk Rukkus, L&apos;Orange & Stik Figa, MF Doom & MF Grimm and more. This show was 10th in the global underground hip hop chart and 72nd in the global hip hop chart. 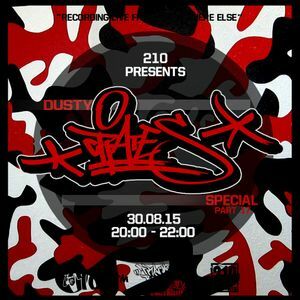 210 member on ITCH FM and Trackside Burners Radio Show..
Make sure you check out episode number 17 of Dusty Crates specials by 210 Presents bunch of Underground Hip Hop and Old School Classics featuring Tame One, Brother Arthur, Mic Geronimo, Havoc, E-Boogie, Trem One, Maylay Sparks and many more.